Do you have too much clutter in your attic, garage, or your whole house? Have you ever had to look for your keys, toothbrush, shoes? Does clearing the clutter and getting organized seem like climbing Mount Everest – a great goal, but not something you want to start today? Ducks In a Row owner, Anne Lucas, brings calm and order back to your life. 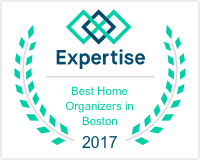 We help you break a huge job (like organizing your attic or garage) into small, manageable tasks. You become free of clutter and learn to stay that way. With Ducks In a Row, your return to order, organization and sanity will be smooth and painless! Life-changing events such as moving, the birth of a new family member, downsizing, the blending of two families or the passing of a loved one can make a busy life seem overwhelming. The helping hands of Ducks in a Row are available to make these times smoother, faster and easier for you and your family.